Water quality of the Lower Gabilan Watershed has been a focus area for staff at CCWG for well over a decade. This area encompasses a large range of landuse including: urban development in Salinas and Castroville; agriculture, particularly intensive row crops such as strawberries and leafy greens; natural wetlands and open space, which used to dominate the landscape but are now found only in fragments. This area is also home to some of the most polluted waterbodies in the state. To deal with these problems, Best Management Practices (BMPs) are put in place by farmers, municipalities and residence. CCWG has an ongoing interest to support the inventory and research of BMPs to address both urban and agricultural sources of non-point source pollution. Surface water quality targets are particularly challenging to meet and manage in intensively cultivated, irrigated and tile-drained landscapes. The current system of regulating individual producers has failed to meet water quality targets. Cooperative approaches that allow producers to understand nutrient transport through their watersheds, and pool resources to efficiently reduce nutrient loading through strategic implementation of on-farm practices and off-farm treatment areas (e.g., constructed wetlands, bioreactors, and vegetated drainages) are a promising alternative to the current system. Many on-farm practices and off-farm treatments have been proven to be effective at mitigating nutrients, but they are often too expensive for individual producers to apply. The overall goal of this project is to establish a cooperative model for pooling resources to comply with water quality regulations, making conservation practices more widely applicable in high-value, irrigated agricultural lands. The cooperative approach acts as a framework for strategic and spatially explicit modeling, siting, and monitoring of on- and off-farm treatment areas. The approach would add value to NRCS’s programs, including EQIP, by providing a governance structure that links implementation of voluntary conservation practices with streamlined regulatory compliance, increasing the efficiency and affordability of program implementation. Growers, regulators, and other stakeholders have a strong incentive under the Ag Order to find effective solutions for improving water quality runoff, particularly nutrients. 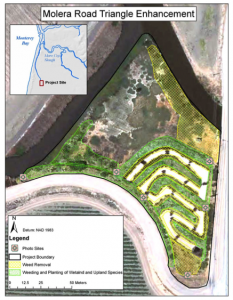 The Central Coast Wetlands Group at Moss Landing Marine Labs, in partnership with The Nature Conservancy, growers, and regulators, is working to develop a cooperative approach to manage nutrients along the central coast. Understanding nutrient fate and transport in the Moro Cojo watershed, including the impact of legacy groundwater inputs, will help identify cooperative management strategies for water quality improvement. Collect and evaluate the best data available for the Moro Cojo watershed, including elevation, soils, land-use, fertilizer application, tile drain discharge, stream flow, crop management, etc. Using available data, model the fate and transport of nutrients through the Moro Cojo watershed. Identify data gaps and collect necessary samples in the field to calibrate and verify model. Evaluate cooperative management strategies of nutrient runoff using off-farm treatment wetlands and identify the most effective size and locations for treatment based on model outputs. Present results to help growers identify the best locations for off-farm natural solutions to improve water quality and habitat (constructed wetlands), and with on-farm improvements, will help the Regional Water Quality Control Board recognize cooperatives approach to meet the agency’s regulatory obligations. The Salinas Valley supports farming of specialty crops including multi-year perennials (strawberries and artichokes) and annuals (leafy greens and broccoli) in constant production, leaving little opportunity for field fallowing. These intensive agricultural operations have led to impaired water quality for which the Central Coast Regional Water Quality Control Board (RB3) has developed a regulatory Agricultural Order, known as the Conditional Waiver of Waste Discharge Requirements for Discharges from Irrigated Lands (Ag Order). 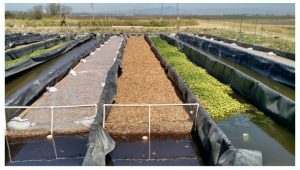 The Central Coast Wetlands Group (CCWG) and partners have demonstrated load reduction potential of off-farm treatment systems (bioreactors, treatment wetlands, etc.) based on the results of local pilot projects over the past decade. However, data from these pilot projects, along with studies in other parts of the U.S.A., are difficult to compare between system types because field variables including pollutant load, flow and retention time and temperature are inconsistent among studies. The purpose of this Treatment Effectiveness Project is to study the nutrient load reduction potential of several off-farm treatment systems for the management of water quality within the Salinas Valley. 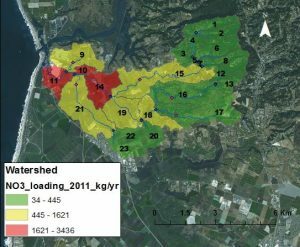 Integration of load reduction estimates into a watershed-based alternative compliance strategy. (Complete: See Attachment D: Draft Lower Salinas Valley Water Quality Cooperative). The INMP grant from the State Water Board, managed by the Regional Water Board, was for on-farm management of water resources as well as implementation of-off farm treatments. The Resource Conservation District of Monterey County as well as the UC Cooperative Extension implemented on-farm assessments and projects, while CCWG focused on constructing off-farm and edge-of-farm projects such as wetlands and bioreactors. The Monterey Bay National Marine Sanctuary conducted coordination and monitoring. The goal of this project was to provide technical assistance to farmers as well as improve water quality from non-point source pollution. With Funding from USEPA Region 9 and the Central Coast Regional Water Quality Control Board (CCRWQCB), CCWG worked with Tetra Tech on an assessment of salt impairments and development of a salt mass balance in the Lower Salinas River and Reclamation Canal watersheds. 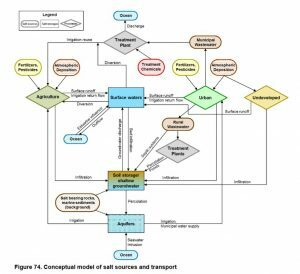 This effort can inform development of salt-related TMDLs by the CCRWQCB and a salt and nutrient management plan for the Salinas Valley aquifers. 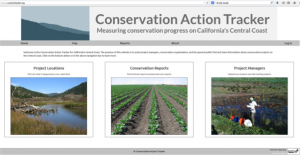 The Central Coast Action Tracker is an effort between the Greater Monterey County Regional Water Management Group including CCWG, and the Central Coast Resource Conservation Districts. The Action Tracker is an online tool that allows project proponents to register and update information on conservation projects such as BMPs across the region in order to track efforts and improve stakeholders’ ability to evaluate collective impacts and effectiveness. The vision is to provide detailed information on various conservation and water quality related projects throughout the Central Coast. CCWG and the Project Team have been working on the building blocks for this website for several years, by gathering input on the content and functional input and output requirements of a tracking system. A database was designed to accommodate various project types from a wide range of organizations. We developed the tracking forms, uploaded relevant GIS data, and have begun entering projects. The site is intended to grow as more and more people realize it’s utility and begin to enter projects. 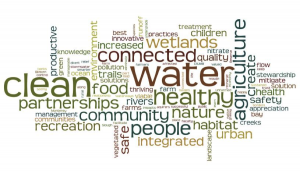 Wetlands, whether naturally occurring or designed for treatment purposes, have an incredible ability to improve water quality degraded by non-point source pollution through filtering and breakdown of nutrients, pesticides and other pollutants. Vegetated treatment wetlands have been used to treat wastewaters worldwide for over 50 years and have been proposed as a Best Management Practice for water quality improvement in the Moro Cojo, Elkhorn Slough and Salinas Valley watersheds (Vymazal, 2010; Habitat Restoration Group, 1996; ABA consultants, 1989). For more about how treatment wetlands work, see our Wetlands page. CCWG received funds through the Round 1 IRWMP implementation grant. This is a large project that is allowing CCWG to coordinate, plan and permit 12 or more acres of treatment wetlands in the lower Tembladero, Moro Cojo and Blanco Drain Watersheds. The final acreage could be achieved through one large or multiple small sites. This is very unusual in the grant world, typically a grant will require implementation of a project as well as design and permitting. However, our region prioritized this project because there is a recognized need for more treatment projects, but there are a lot of barriers to building them in this County. We are working with a number of landowners on potential sites in the project area, and hope to be able to exceed the 12 acres required of the grant. This wetland site was created in collaboration with The Watershed Institute at CSUMB and the Monterey County Water Resources Agency. It was designed to be used as an experimental outdoor laboratory looking into the nutrient and pesticide removal capabilities of wetlands. Several masters theses have been conducted at this site through CSUMB. Construction of the sinuous berms that created the upper wetland was completed using a small bulldozer in late 2005. 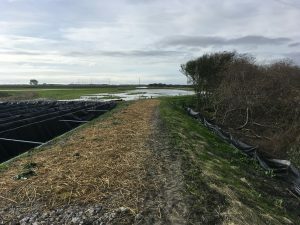 Several thousand native wetland and upland plants were planted in early 2006, including bulrushes, on the banks and on 1-meter wide submerged berms installed across the channel in several places. By 2006, the bulrushes were approaching 3 m in height, lining approximately 75% of the length of the channel bank.